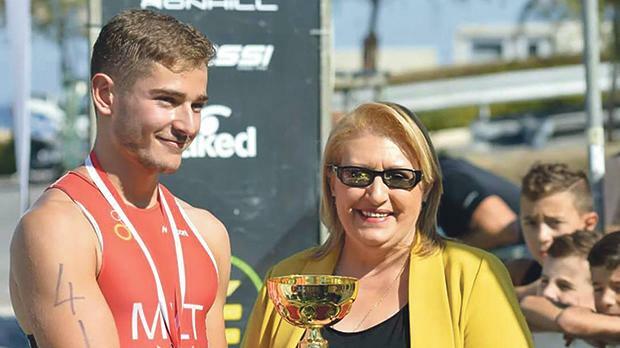 Demicoli receiving the trophy from President Marie-Louise Coleiro Preca for placing first in the Birkirkara St Joseph Club Under 23 triathlon series. Shaun Demicoli pictured during the National Sprint Triathlon as he was coming out of the water to start the cycling section. 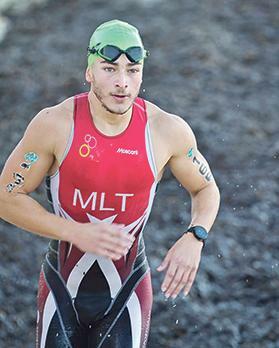 After having spent almost 12 years training many sport disciplines in Sport Malta’s #OnTheMove programme, such as football, basketball and gymnastics, Shaun Demicoli was spotted for his potential in triathlon. Over the past few years, he has concentrated his training more in athletics and swimming, which are both vital for his triathlon skills, and the effort seems to be paying off. He achieved first place in both last summer’s National Sprint Triathlon as well as in the Under-23 category of the triathlon series organised by the Birkirkara St Joseph Club. Demicoli said the wide range of different sports offered by i#OnTheMove’s programmes helped him build his physical fitness and developed his abilities along the years. At the same time Demicoli’s academic studies have not suffered, and he is looking forward to graduate in mechanical engineering at the University of Malta. The 2012 and 2016 Olympic triatholon gold medallist Alistair Brownlee and the 2012 triathlon world champion Jonny Brownlee are Demicoli’s inspiration and his ambition is to one day be able to be meet and compete with the Brownlee brothers triatholon stars. Sport Malta’s #On the Move winter programme, formerly known as Skolasport, has been supported by Kellogg’s since 1999. For further information about the variety of educational sports disciplines in the programme, call 2203 6000, e-mail info@sportmalta.org.mt or visit the website below.